i wonder what the life span of that is. seems similar to like fake tattoos that kids put on with water. especially the way it transfers to his arms as well. Don't know a lot about it, I know that an activating agent is sprayed on and it dissolves the backing, and the print floats in the water, then the part is dunked in. 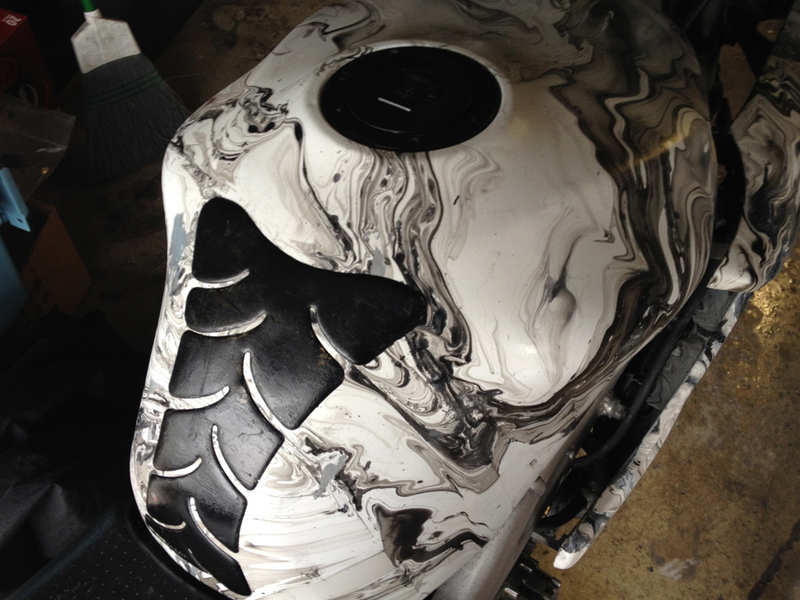 I remember seeing a old episode of "American Chopper" where they did a tank and such with a $100 bill print or something and they locked it in with a few coats of clear I believe. Super cool process though, there's only 1 place where I live that does it, not even sure on the cost of it. This is how most of those mock "carbon fiber" parts you see floating around ebay are made. You know, mirrors, turn signals etc. To me the process always produces a super fake looking product and I haven't seen an application where I don't just like a nice coat of paint better. The image always stretches with curves and has that old school cgi texture mapping feel. It's pretty durable, though, and definitely not a temporary decal. But I've never really been an image heavy graphics guy. 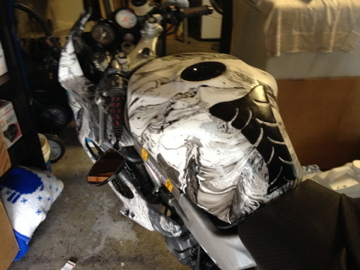 Beautiful one off airbrushed ladies on a nice clean gas tank? I'll pass... save that stuff for a painting. I like my bikes to look like bikes, my plastic to look like plastic, my carbon fiber to look like carbon fiber, aluminum to look like aluminum, paint to look like paint, and none of those used to hide the natural engineering and shape of a product. This is how they have been applying camouflage to rifles (AR15's) for a few years now. There's a guy that does that local to me, I contacted him about visiting and seeing how it's done, and he extended an open invitation to me. Prices seem very reasonable, based on size. They quoted me 150 w/ disassembly & reassembly which I thought was high. Guys on the Glock forum say this stuff holds up very well. They also say if you holster and re holster a lot, it will wear off. Not and issue for the bike, but if it's an area that you constantly rub on it may become one. My guess it's that they'll eventually use a robotic arm to dip and develop better transfers to help improve on the stretchy graphic problem. 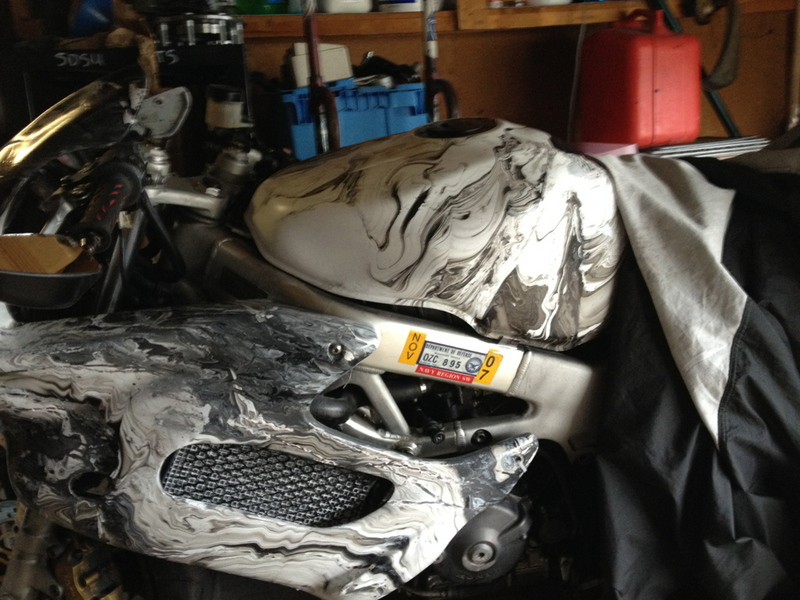 Then 7moore7 can get his whole bike carbon fiberized like we all know he covets. Those guns come apart pretty easily, ya know. Once this world has the revelation that carbon fiber only looks cool because of the properties that it conveys I will consider myself a success. Titanium is sweet because it's color means lightweight strength, not cause brushed shiny brown grey is appealing. Digital camo is cool because it has a functional attribute. And of course yellow circles are the fastest shape so they should be everywhere. Or maybe I need brushed yellow carbon texture circles instead? I knew you'd come back to carbon by the end of your post. You're not fooling anyone. I am doing something sorta similar to the hawk I got a couple weeks ago. 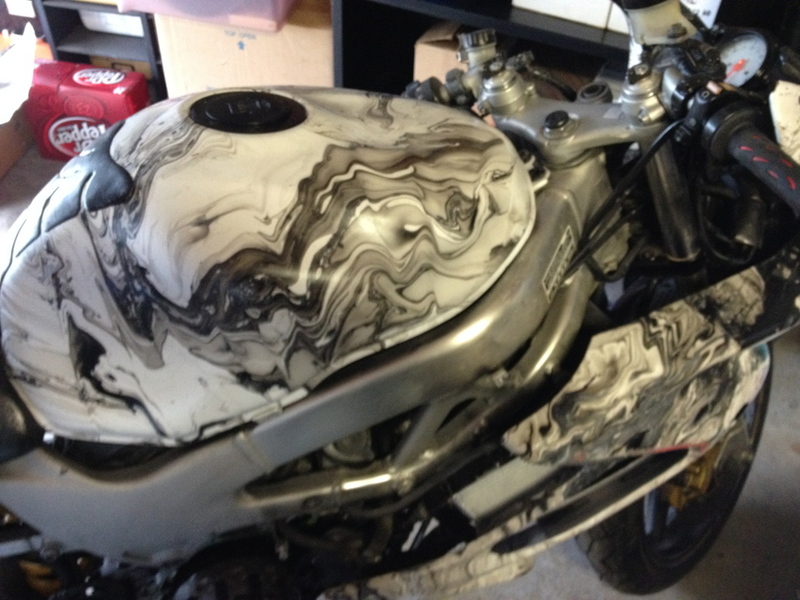 But its floating oil paint on the water then dipping the parts not floating graphics. Ok so its not that similar but I did get to say floating twice in one sentence. I painted it once last week then rashed it before the paint was even dry so I am going to take this "opportunity" to re-do it and include some gold paint to offset the black / white. Its not the slickest paint job out there, but for a redneck with 12 cans of beer and two cans of rustolium I would say it didnt turn out to awful bad. Better then the rattlecan flat black state I got her in. This is what 7moore will look like when he sees this . Well, that's if he ever shows up around here again some time soon. How in the hell did you get a picture of the inside of my mind?!?!? !